“The chamber is still in the process of gathering information of the scope and full impact of this error,” Orie said. He added that, after meeting defence and prosecution lawyers, he would announce a new start date for the prosecution’s presentation of evidence and witnesses “as soon as possible”. This phase had been due to start at the end of May. “We don’t agree with this. We ask to speed up the trial and to speed up the judgment, because it is important for the past, for Bosnia and the whole region, and it’s important for the future,” said Hatidza Mehmedovic, whose husband and two sons, one still a teenager, were among over 7,000 men and boys massacred by Mladic’s forces in Srebrenica. For much of Thursday’s proceedings, Mladic listened impassively to the evidence presented against him. He became animated only once, clapping and giving a thumbs-up sign when a video was shown of him interrogating and shouting at the Dutch UN commander, Thom Karremans, whose troops were supposed to protect the enclave but were hopelessly outnumbered. The prosecution also showed footage of Mladic on the scene while men and boys were separated from their families. Film was shown of the operation to round up men and boys who had tried to escape through the woods and of piles of corpses outside a nearby warehouse. Other evidence included Mladic’s written order to provide several tonnes of diesel fuel to a Bosnian Serb officer in Zvornik whose job it was to excavate mass graves and rebury the remains of the victims in smaller graves in an effort to avoid detection. 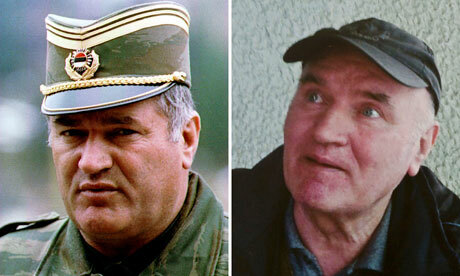 Mladic’s lawyers are demanding a delay of six months. Tribunal sources suggested the delay would be significantly less than that, particularly in light of previous criticism of the court for its glacial pace. The trial of the former Yugoslav president Slobodan Milosevic lasted five years and only ended with his death from a heart attack in a cell in The Hague in March 2006. After the morning session, Mehmedovic accused the international community of conniving in continuing “ethnic cleansing”. She pointed to a change in municipal law in Srebrenica this month, accepted by the international community, which meant that Muslim survivors of the massacre could not vote for the mayor. The municipality is now likely to come under Serb control in elections in October. Thinking of all the people get caught between warfronts and were used by both sides, thousands of young women and men who were raped and murdered after their surrender against International War Convention, the abducted and disappeared, the journalists who lost their lives for an independent reporting from north and south. The International Community has failed to protect you. You have no use of UN resolutions. The people who prevented an intervention of IC with all their tricks like Dayan Jayathilake, Tamara Kunanayagam and all other SL delegates and international corrupted players should bear their responsibility, not only the military. They are the real murderers. We never forgive these people. The LTTE responsibles who used you as human shields should face a charge, who recruited you as child soldiers, as adults and sent you against your will.